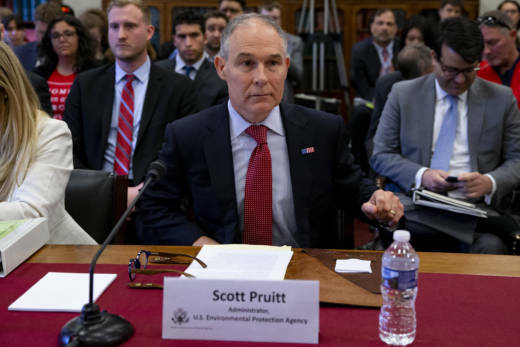 Environmental Protection Agency Administrator Scott Pruitt said Thursday he is still considering whether to overturn a federal waiver that permits California to set its own tailpipe emission standards. The waiver also permits other states to opt in to California’s standards, which are more rigorous than the requirements set by the federal government. California Attorney General Xavier Becerra has said he is prepared to sue the EPA if it overturns the waiver. California is aiming to reduce its carbon dioxide emissions by 40 percent by 2030. Pruitt's statements come on the heels of a federal appeals court ruling on Monday that blocks the Trump administration from delaying a rule that would raise penalties for automakers who don't meet fuel efficiency standards. Since the 1970s, federal regulators have sought to toughen fuel efficiency standards by fining automakers $55 for every mile-per-gallon that falls short of government-set energy efficiency targets. A proposal to raise the fine to $140 per mpg shortfall was introduced in 2015 by the National Highway Traffic Safety Administration. Although slated to go into effect starting from the 2019 model year, the Trump Administration has tried to delay the steeper fines. California and four other states then sued, saying a delay would cost consumers and increase pollution. The Second Circuit’s ruling protects this penalty for now. But regulators can still overturn it. Pruitt made the statements during a hearing before lawmakers over his profligate spending and lobbyist ties. The public grilling at back-to-back House hearings, called formally to consider EPA’s budget, came as support has appeared to erode for Pruitt among fellow Republicans after revelations about unusual security spending, first-class flights, a sweetheart condo lease and more. Even Republicans who heartily support Pruitt’s policy agenda said his apparent lapses had to be scrutinized. Asked whether Pruitt should resign, he said that’s not his call and suggested that’s up to President Donald Trump. Molly Peterson and Associated Press contributed to this report.